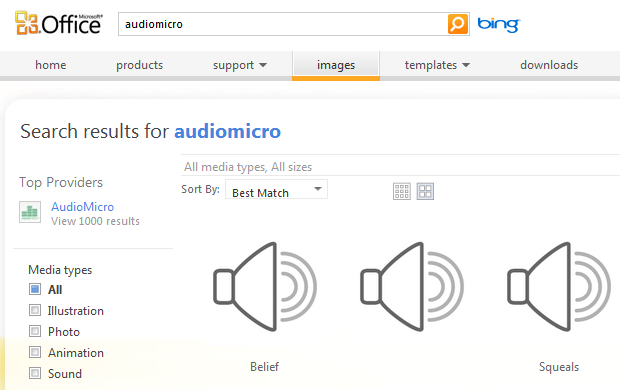 AudioMicro, a site where you can find royalty-free stock music and sound effects backed by DFJ Frontier and Fotolia, has struck a deal with Microsoft to provide music and sound effect files to Microsoft Office 2010 users worldwide. Under the terms of the licensing and distribution deal, Microsoft Office 2010 users are able to select from a hand-picked collection of over 1,500 music tracks and sound effects at Office.com to use with any Microsoft Office project. The partnership is noteworthy because AudioMicro launched in 2008 with a heavy emphasis on the needs of PowerPoint slideshow creators, AudioMicro founder and CEO Ryan Born says. Royalty-free sound effects offered by AudioMicro on Office.com include parts of The Hollywood Edge sound effects library created by the sound editors of Soundelux, whose credits include such films as Unstoppable, Inglourious Basterds, The Bourne Ultimatum and Braveheart. AudioMicro is not all about stock music and sound effects, by the way – the company operates a constantly growing network of digital content licensing marketplaces, including for cartoons, celebrity pictures, and tattoo flash. The company also announced that it recently brought on Myspace VP Sean Percival as an advisor – he will be helping the young company out with all things SEO and social.